The church as seen from the graveyard; one enters the porch from the place de Deux Rennes. And in the porch the mind of a curious researcher starts wondering . . . Many see the logo at the top as representing the Holy Grail, but no, that cup represents the Eucharist and is a common symbol in Roman Catholic churches everywhere. The message though, says; "Love one another and I have loved you." 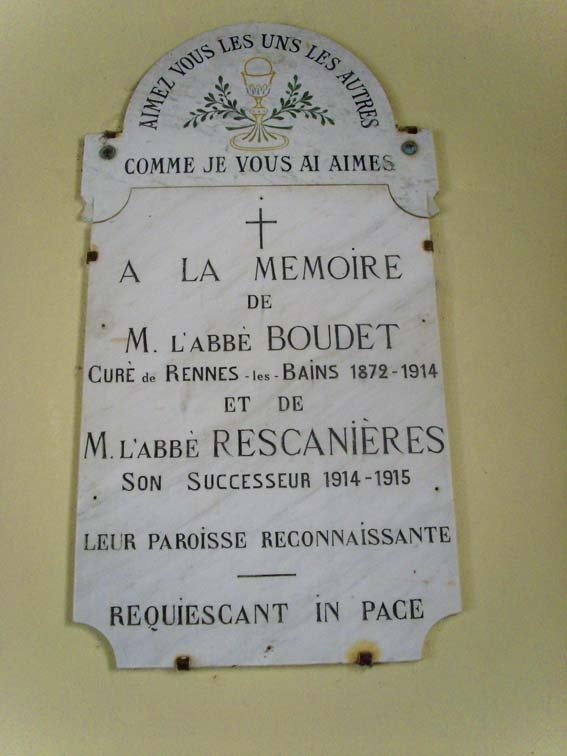 The plaque is to the memory of the famous priest, Henri Boudet, who wrote "La Vrai Langue Celtique" and to his successor. There are stories that both died in mysterious circumstances, especially Boudet's successor, Rescanières, who died only a year later. But no, they both died of natural causes. 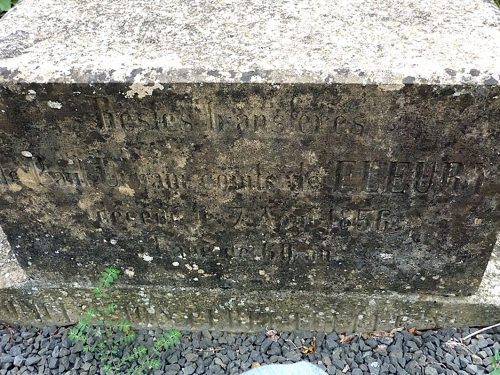 There is another tombstone of a priest in the graveyard leading to similar speculation. To start with it seems to be decorated by a Templar Cross - which could be Celtic of course. The curé was the one before Henri Boudet, Jean Vié, which sounds like January - but no, it is a common name for this region. And the date is interpreted as 17th January, but it was the first of September and represented in an ordinary manner of the time it was done. Nothing to do with Blue Apples day whatsoever! For more about Blue Apples Day click here. When you leave the porch to go into the graveyard, on the left, cemented to the church wall, is a Visigothic pillar. 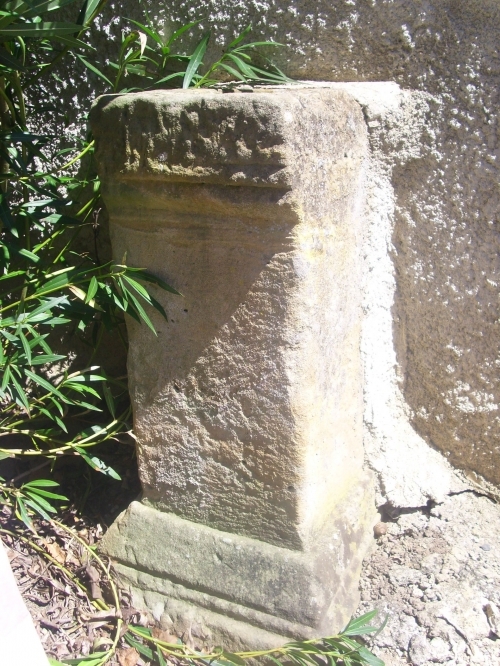 There is a square indent on the top, showing it once supported an altar slab, as was the style in Visigothic days and as did the Visigothic pillar found at Rennes-le-Château. So we know that there was a church there in the Dark Ages - 500 to 800AD, or maybe even before. Some say the very first church was built on the site of a Celtic or Roman Temple, because this place, where is now the graveyard, was a Celtic nementon, a meeting place or sacred place. It's true some stones in the wall inside the church were originally Roman, and re-used. One day I was in town with my friend Suzette, who used to teach at Rennes-les-Bains. She wanted to go to the cemetery to leave some flowers on the grave of her friend Jacqueline, who had died in the floods of 1992. Born in 1938, she was an old lady known to everyone in the town, tall and thin but always friendly, she has never been forgotten. On the right, as one descends into the graveyard, is the part put aside for poor people that the municipality pays to bury. 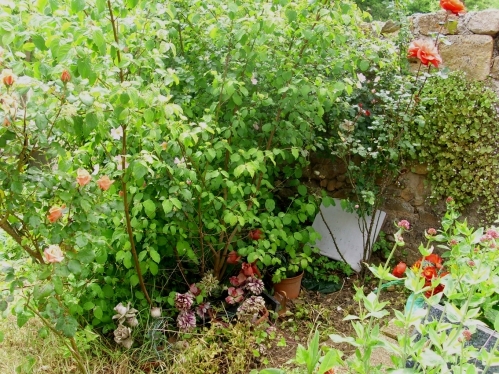 Poor Jaqueline's grave was very overgrown. 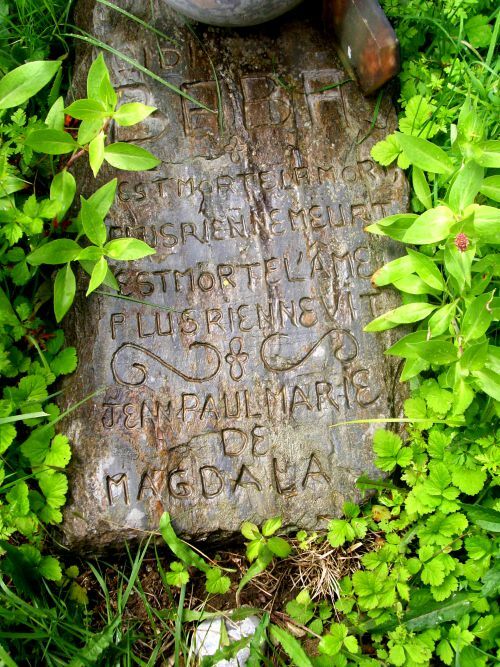 We noticed at once the name; Jean Paul Marie de Magdala. And Magdala was the home town of Mary Magdalene. Est morte la mort, plus rien ne meurt. Jean Paul Marie de Magdala"
Morgan Roussel sent me this wording which translates approximately as; "Dead by death, then nothing dies. But the death of the soul? then nothing lives." I looked up the name Sidi Baba on the Internet, it seems to be a popular name in Morocco, in Rabans, in Meknes - one Sidi Baba is a wildly good rock musician. The sentiments of the message are, I believe, more Muslim than Catholic. But who was the Sidi Baba who died in Rennes-les-Bains? A mystery indeed. 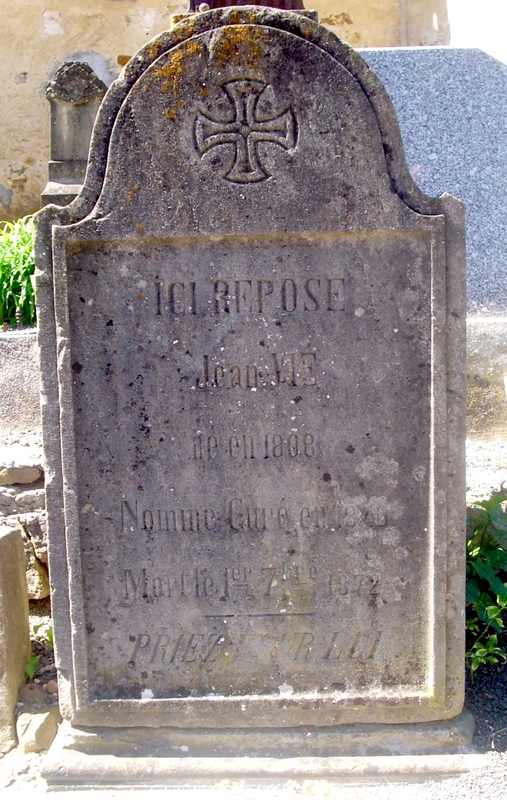 Was his epitaph quoting from a poet or writer called Jean Paul Marie de Magdala? If so, I can't find a reference to anyone called this - was it a reference to the saints, John, Paul, and Mary Magdalene? and why? An article on an English esoteric web-site claimed the gravestone was covering an entrance to a grotto where was an Egyptian mummy! Maybe Sidi Baba was a New Age traveller who died at Rennes-les-Bains? On my next visit, I called in at the Mairie or Town Hall. 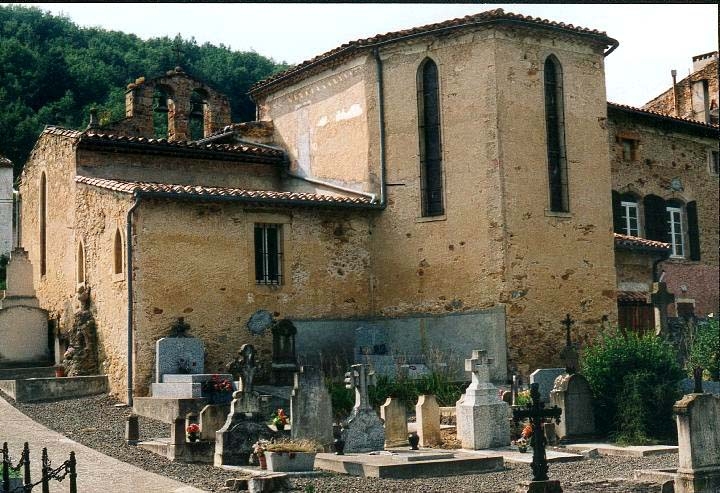 Sidi Baba was a real person who existed and lived at Rennes-les-Bains, and died there. His friends or family designed his grave. 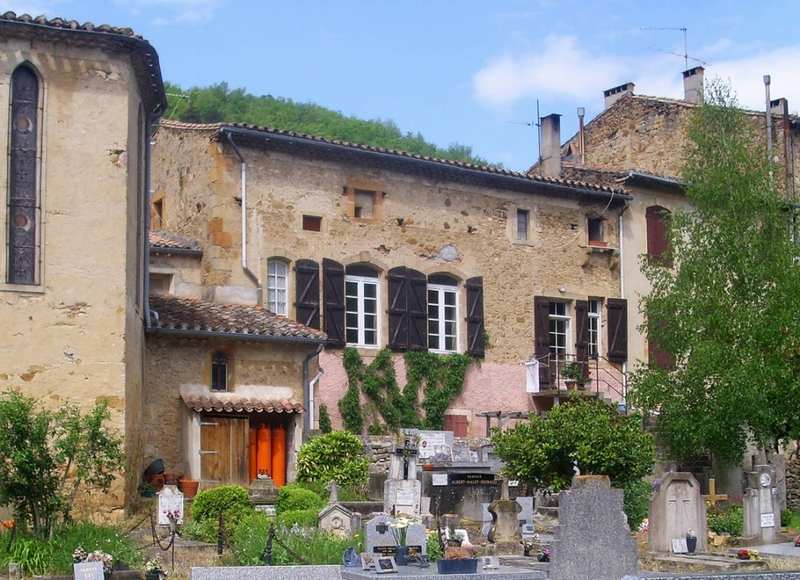 In France, unlike England, graveyards are not religious, all citizens have the right to be buried in them and can write what they wish on their graves. So there is no mystery here - except Marie de Magdala? I can think of only one explanation. Something about Rennes-les-Bains is a bit bizarre. Everybody talks about Mary Magdalene, you only have to eat at the pizzeria and you'll hear people round you talking about her. 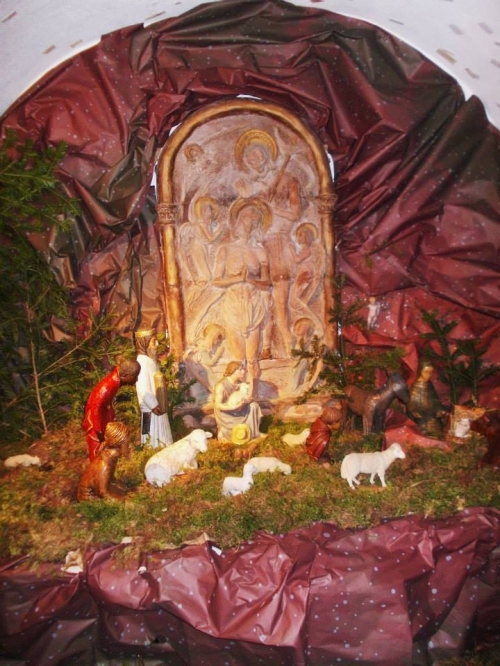 My last trip we met some people from northern England, she had been brought up a Catholic, she wanted to find the "truth" about Mary M she said, because the Catholics were still not sure. 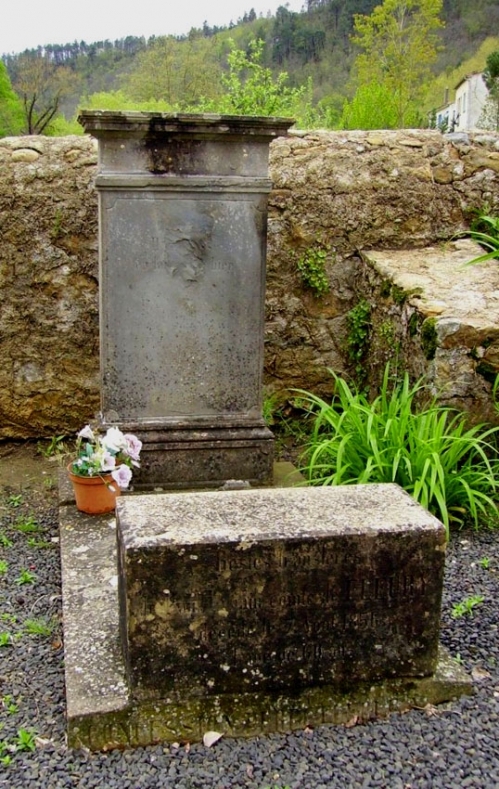 I asked monsieur le maire if he knew some British person was claiming this tomb hid a mummy? He laughed. "Oh, we get a lot of that sort of thing here," he said. And so I like to think the friends or family of Sidi Baba wanted to commemorate this, to link it to Mary Magdalene to show that he enjoyed living in Rennes-les-Bains. A little further long is the grave of the man with two graves. The inscription to Paul Vincent de Fleury is very hard to read, and the second grave has not long ago been removed. This is a real mystery and indeed, there were masonic truths encoded in the difference between the two different inscriptions on the two graves. Gérard de Sède wrote about it in the book "L'Or de Rennes" and there is a detailed discussion in my own book - click here. In the rest of the graveyard many of the graves are new, as a result of the terrible floods of 1992. 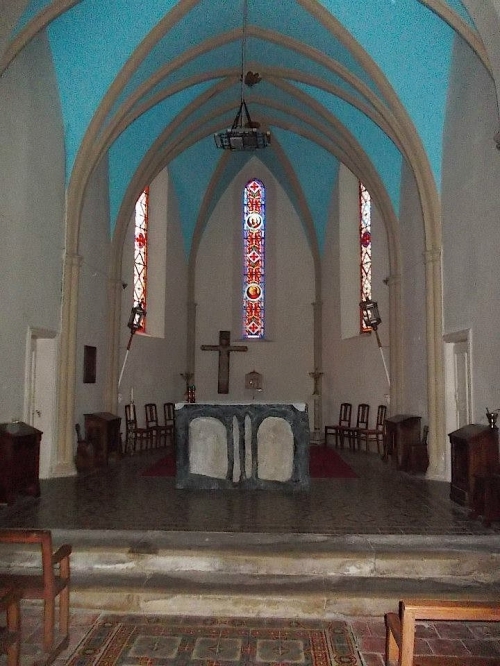 The Presbytère, where the priest lives, has also been renovated. When you visit the graveyard, don't be surprised the see graves of people called Saunière or Denarnaud. The two were large families who lived for many years in Rennes-les-Bains, in Rennes-le-Château, and in many other villages of the region. I have the registers from 1664. We need to remember that in those pre-motorcar days, people didn't stray from home that often and the small villages we see today were much more populated. In the 1950's many young people struggled to get an education and then left home for the cities which had more real opportunities for well-paid positions. It's only recently, with people living longer and retiring to the countryside, plus weathier families buying second homes, that populations have started to rise again.